Is there any way to increase the line weight so that it has a larger shape to actually cut out? Would I need to set the state outline at 0 cut height, and put a shape in the background larger than this shape with a full cut through depth? Looks like you have the project set to use a V-Bit for carving based on the image. I would just move the state outline to a different work piece and use a proper bit for cutting it out. 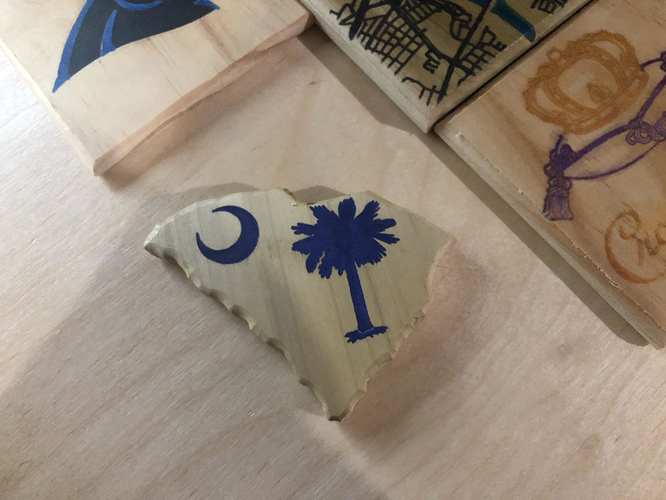 Remove the SC outline from the first work piece. Remove the V-Bit as the detail bit from the first work piece. Change the primary bit to V-Bit 90° on the first work piece. Remove the V-Bit as the detail bit from the second work piece. Carve the first work piece design with V-Bit. Carve the second work piece cutout with other bit. Well damn, my dude. I appreciate the help Brandon. No problem! I hope it worked out as I intended it to; show us what it looks like when you get it carved out. Pretty happy with how it turned out, a little bit small so gonna have to re-do a bit bigger…currently danger sized for a coaster. I’m glad everything worked out OK and looking forward to seeing the larger one.